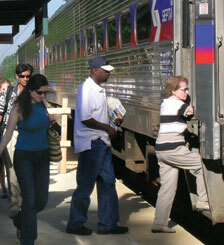 Chester County offers passenger rail service provided by both SEPTA and Amtrak. Both agencies are located along the same corridor and provide service at select locations. The following table showcases where SEPTA and Amtrak service is provided in Chester County. SEPTA's Paoli/Thorndale Line is one of thirteen passenger rail lines that serve the region, in particular Chester County. The rail line operates through the heart of Chester County between Thorndale and downtown Philadelphia. In Philadelphia, SEPTA users are able to board other SEPTA trains and travel all over the region. Paoli/Thorndale Line stops are shown above in the corresponding table. Please contact SEPTA for detailed information regarding the Paoli/Thorndale schedule or fare information. SEPTA users can buy your tickets in advance at select stations, or on the train. Please note that service is limited west of Malvern during the weekends (No Sunday service and limited Saturday service). For information about SEPTA's ADA services go to Accessible SEPTA or call 215-580-7800. System Status offers SEPTA users status information about SEPTA's transit system. It allows users to view particular transits routes and see whether a certain service is running according to schedule or if there is any alteration in service. Similar to System Status, TrainView reports the status for all Regional Line trains running on the SEPTA system. This reference tool allows SEPTA users to see whether the train is on schedule. SEPTA Key is a new electronic fare payment and collection system for SEPTA transit. SEPTA Key has been launched in several phases, beginning in 2017. In Chester County, all residents can use SEPTA Key for bus travel throughout the county. 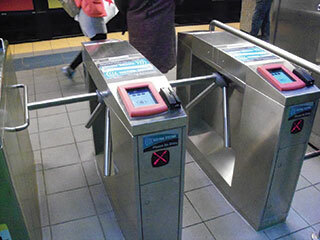 Regional Rail SEPTA Key systems are currently in the installation and testing phase. SEPTA Key Regional Rail deployment will begin with the Anywhere Pass in Zone 4 stations and the remainder of the Regional Rail deployment is scheduled to occur throughout 2018. SEPTA Senior Key Card is available to all seniors for use within the SEPTA service area. In Chester County, SEPTA Senior Key Card can be tapped on buses and used as a flash pass on Regional Rail until the full Regional Rail deployment occurs next year. For more information on SEPTA Key and SEPTA Senior Key Card, please visit www.septa.org/key. The "Keystone Corridor" is part of Amtrak's larger Northeast Corridor System. The Keystone Corridor runs from Harrisburg to Philadelphia and on to New York. This route in particular runs through Chester County and can be used to travel toward Lancaster and Harrisburg or to Philadelphia, as well as points north and south along the eastern United States. AMTRAK trains stop at the following Chester County stations: Parkesburg, Coatesville, Downingtown, Exton and Paoli. Please contact Amtrak for detailed information regarding the Keystone schedule or fare information. Trains have set fares based on the distance you want to travel. Amtrak users can buy tickets on line, at the station, or on the train. 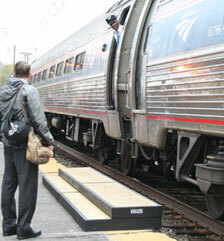 For information about Amtrak's ADA services go to Accessible Travel Services or call 1-800-872-7245.